I have kept Diary's of most my litters, this Diary will be a bit different, sometimes a story from Laurie, sometimes from me. Star's temperature had dropped so I drove down to Laurie's house to hang out and wait, and waiting we did! I think it is hard to watch your "best girl" in some distress as she enters stage one labor and is uncomfortable. Star spent most the day nesting, panting and resting then about 11pm went to SLEEP and Star slept hard. I woke up about 5am and went to check on Laurie and Star, I had been up at 1am also and all was "Fine" - however at 5am clearly things were progressing. I went to let my dogs out of the car where they had been sleeping for a stretch and potty. I also worked the kinks out of my back and knees after sleeping in a very comfortable chair for the night, it was still a CHAIR. at 6am things were rolling we were ready, and it was only a matter of time. 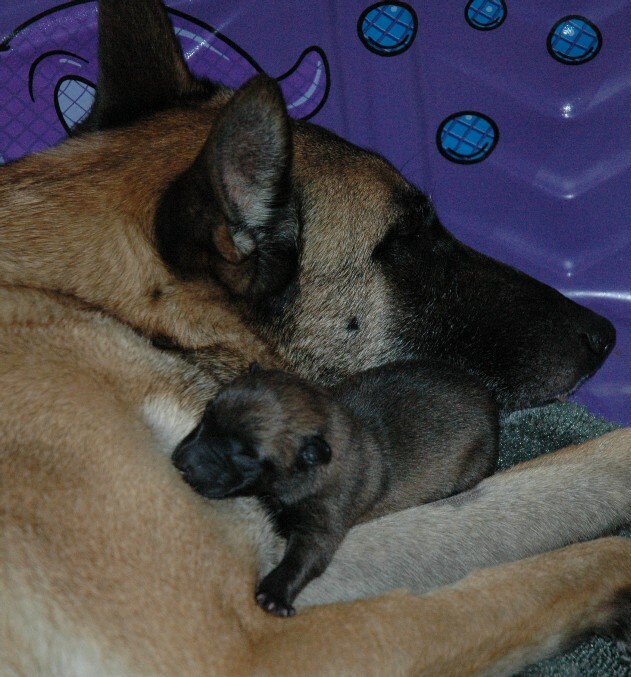 Star had an easy quick whelping of her first 3 pups starting about 6:15 - 3 pups in 20 min, then 40 min a 4th pup. Then we waited, per our wonderful vet Cheryl Lopate's instructions 2 hours no puppies, we call, and we did. Oxytocin shot, 30 min no puppies we were to call again. I had a hunch so we planned to be ready to load EVERYONE Up into the cars and make the 40 min dash to the vet if Cheryl said go. 30 min later we had our answer, Cheryl wanted to see Star Laurie took off with Star, I locked up the house grabbed the pups in their warm box and followed her up about 10 min behind. When I got to the vet they were doing an ultrasound. The pups were okay for now. Next was an X-ray, that would tell us what the hunch had been on ultrasound. "One" naughty puppy had made a left turn right befor the birth canal her head and shoulder turned to the left, instead of going straight ahead!!! 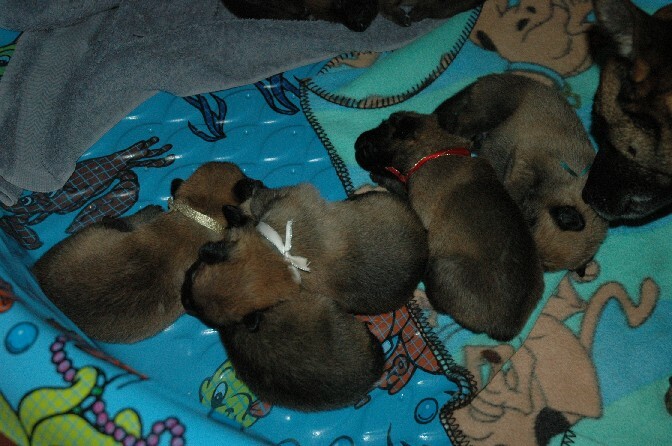 Many jokes were made about making sure that that pup does not go to a SAR home or that it must be a boy because men never ask directions, while we were waiting xrays to be developed and prep was made for the csection Star tended to her 4 pups, nursing and cleaning them. 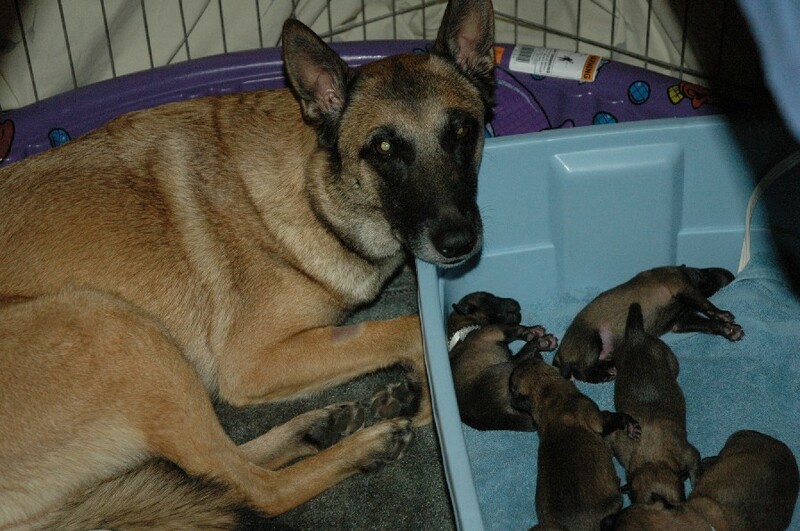 Then it was off to prep for her for the c section, and the pups went to an incubator for the duration. Lefty as she was called by the vet staff was the biggest challenge to revive but all 4 remaining pups made it thanks to the great dedication to the amazing staff of Wilsonville Vet. This is where the Diary will pause for now, Laurie, Star and all the babies are doing GREAT below are pictures from the prior 24 hours. I went down to see Star and her babies and everyone is doing great! Pups have good weight and feel very strong. Oh fun to be granny and go down and visit everyone! I took some pictures but they are not great, will upload more pictures when Laurie sends me hers. Okay I could not help it, I went back down to see Laurie, Star and the Moon babies. 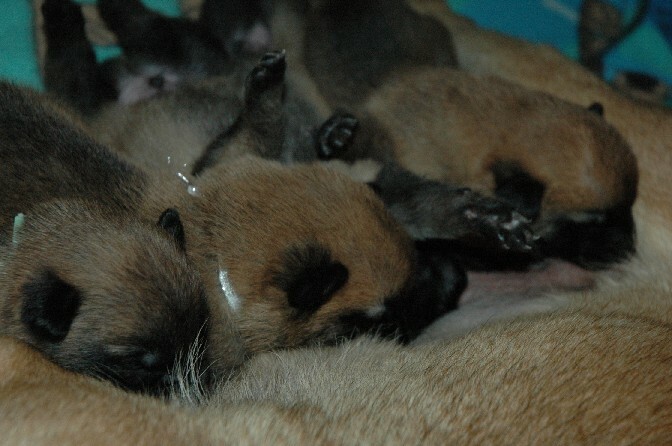 All is going great, Laurie starts the Early Nurological Stimulatoin with the puppies tonight. The pups are also moving into her spare bedroom tonight, a bigger whelping box in what will be the puppy room as the babies outgrow their kiddy pool. Weight gains continue to be very good and Star is being a great mom. Laurie, Star and pups survived dewclaw removal. Early Nurological Stimulatoin continues! Pups continue to have very good weight gains. 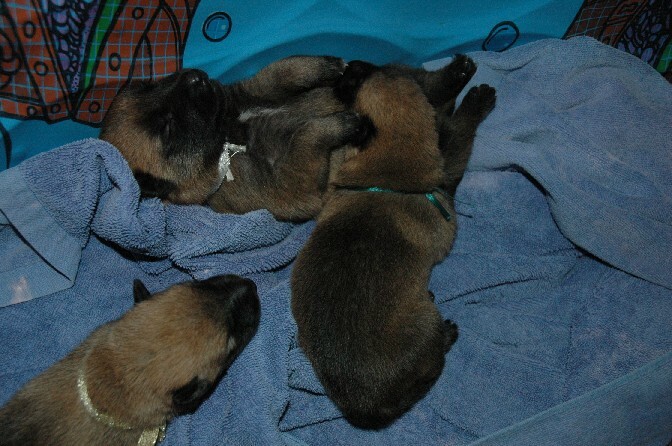 All the pups doubled their weight by 8 days of age, Star and the pups continue to do well. 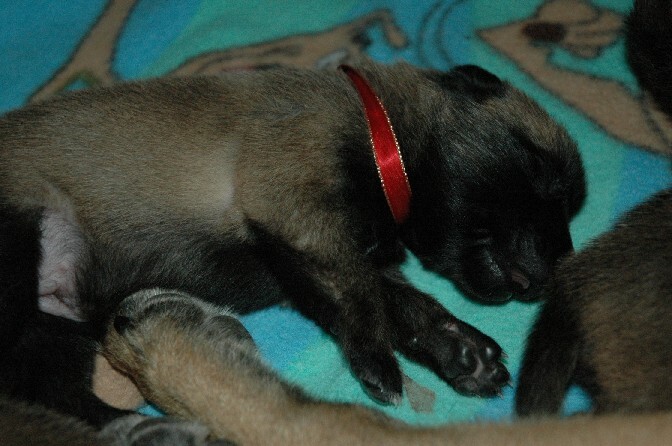 Individual pictures added to the page for each pup. I made a quick trip down to Salem, decided it was time to join the 21st century and get an MP3 player, so visited with Star and the babies and went out to dinner with Laurie - not fancy! but these days a copuon for IHOP for a buy one get a free meal, and not having to fix dinner is a winner for me! ANYWAY - the babies are growing so fast! they all have the starts of eye slits! Silver seems the most advaned for opening his eyes. 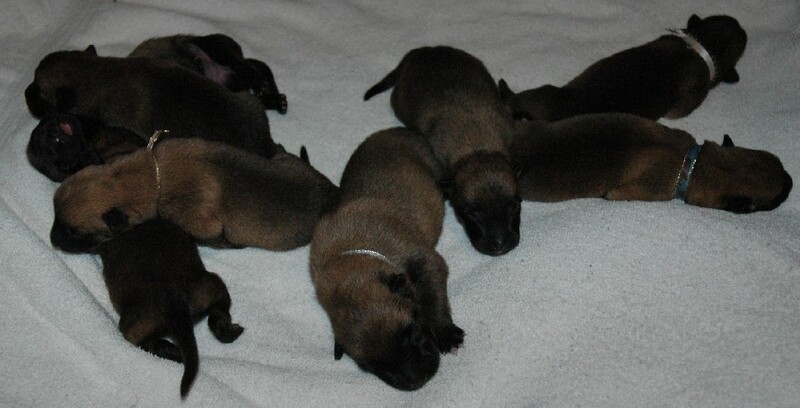 on Thursday they will b 2 weeks old. I always forget how FAST this time goes. Laurie promises pictures soon! The promised pictures! 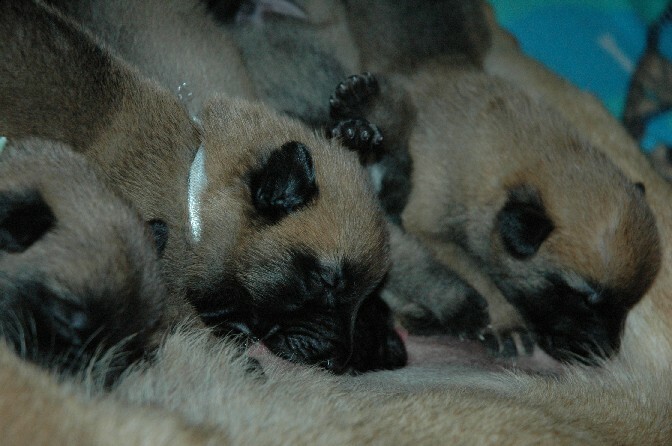 the pups are almost 2 weeks old!